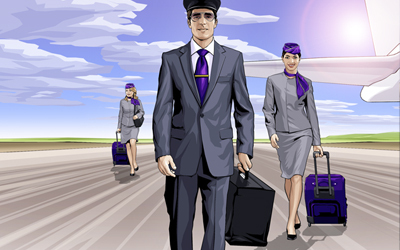 Information we collect: Departing city or airport, destination city or airport, departure date, return date, number of passengers, trip type, flight class, addition of hotel, name, phone number, email address, additional details, IP address, information from cookies, information about your computer or device (e.g. device and browser type), information about how you use our website (e.g. which pages you have viewed, the time when you view them and what you clicked on, the geographical location from which you accessed our website (based on your IP address). How we use your information: for administrative and business purposes (particularly to contact you), to improve our business and website, to fulfil our contractual obligations, to advertise our goods and services, to analyse your use of our website, and to perform research based on the information provided within your enquiry. Disclosure of your information to third parties: only to the extent necessary to run our business and to our service providers. How we secure your information: using appropriate technical and organisational measures such as storing your information on secure servers that are IP restricted, encrypting transfers of data to or from our servers using Secure Sockets Layer (SSL) technology, only granting access to your information where necessary and encrypted email. Transfers of your information outside the European Economic Area: we will only transfer your information outside the European Economic Area if we are required to do so by law. Where we do so, we will ensure appropriate safeguards are in place, including making sure that third parties we use who transfer your information outside the European Economic Area have self-certified themselves as compliant with the EU-U.S. Privacy Shield. Use of automated decision making and profiling: we do not use automated decision making or profiling. Sensitive personal information: we do not knowingly or intentionally collect what is commonly referred to as ‘sensitive personal information. Please do not submit sensitive personal information about you to us. For more information, please see the main section below entitled Sensitive Personal Information. The data controller in respect of our website is SKYCLUB (company registration number: 06129488) of 2 Chitty Street, London, W1T 4AP, UK. You can contact the data controller by writing to 2 Chitty Street, London, W1T 4AP, UK or sending an email to data-controller@skyclub.com. The data protection officer for the data controller is Joe Marks. You can contact the data protection officer by writing to 2 Chitty Street, London, W1T 4AP, UK or sending an email to data-controller@skyclub.com. Legal basis for processing: we and our third party hosting provider legitimate interests (Article 6(1)(f) of the General Data Protection Regulation). When you contact us using our enquiry form, we collect departing city, arrival city, departure date, return date, number of passengers, trip type, flight class, hotel addition, name, email address, phone number and additional details. When you contact us using our contact form, we collect name, email address and IP address. We also collect any other information you provide to us when you complete the contact form, including any optional information, such as: phone number and message. If you do not supply the optional information required by our contact form, we will not be able to respond to your enquiry by phone. Messages you send us via our contact form will be stored within the European Economic Area on our third-party hosting in Ireland. Our third party hosting provider is Amazon Web Services. We record phone calls for security and training purposes. When you sign up for our e-newsletter on our website or receive news, offers and discounted flights from us by making enquiry, we collect your name, email address, phone number and travel details including departure and return date, departing and arrival city, number of passengers, trip type, flight class, hotel and additional comments. We use technologies such as web beacons (small graphic files) in the emails we send to allow us to assess the level of engagement our emails receive by measuring information such as the delivery rates, open rates and click through rates. We will only use web beacons in our emails if you have consented to us doing so. For more information on how we use web beacons in our e-newsletter emails, see our cookies policy which is available here. We collect and use information from individuals who make an enquiry on our website in accordance with this section and the section entitled Disclosure and additional uses of your information. When you make an enquiry on our website, we collect your name, email address, phone number and travel details including departure and return date, departing and arrival city, number of passengers, trip type and flight class. If you do not provide this information, you will not be able to obtain services from us on our website or enter into a contract with us. Legitimate interests: we need the mandatory information collected by our enquiry form to establish the details of the flight they would like prices for, as well as contact details to relay these prices back to them. We also collect optional information from you, such as whether you would like a hotel and additional comments. Legal basis for processing:our legitimate interests (Article 6(1)(f) of the General Data Protection Regulation). Legitimate interests: Enables a customer to provide additional details retaining to their travel arrangements. At the point of submitting your enquiry you may receive future marketing communications from us. You can opt-out from receiving marketing communications in relation to our goods and which are similar to those which you purchase from us, by changing your marketing preference within the email. We automate the display advertisements containing our products and services on other websites you visit, you based on the fact that you have visited our website using cookies. For further information on the cookies we use, please see our cookies policy which is available here. How to object: you can block these cookies by blocking third party cookies using browser settings. For further information, please see our cookies policy: here. Our web analytics service, Google Analytics collects information such as your location (based on your IP address) and your behaviour (based on cookies) when you access our website (such as the pages you visit and what you click on. We will only process information from cookies if you have consented to us setting cookies on your computer in accordance with our cookies policy here. We use web beacons in our marketing emails to analyse who opens our emails and what actions they take (for example, what they click on). We will only process information from web beacons if you have consented to their use in accordance with our cookies policy here. How to object: You may contact us in order to object and we will remove you from the mailing list. Alternatively, you can opt out directly within the email. Legitimate interests: analysing the level of engagement and effectiveness of our marketing emails and content. Our third party service providers are located in Ireland and the United States of America. Legitimate interest relied on: preventing crime or suspected criminal activity (such as fraud). Legitimate interest relied on: enforcing our legal rights and taking steps to enforce our legal rights. Legitimate interest relied on: resolving disputes and potential disputes. Legitimate interest relied on: where the legal obligations are part of the laws of another country and have not been integrated into the United Kingdom’s legal framework, we have a legitimate interest in complying with these obligations. Correspondence and enquiries: when you make an enquiry or correspond with us for any reason, whether by email or via our contact form or by phone, we will retain your information for as long as it takes to respond to and resolve your enquiry, and for [a further 12 month(s)], after which point we will delete your information. [E-Newsletter: we retain the information you used to sign up for our e-newsletter for as long as you remain subscribed (i.e. you do not unsubscribe) or if we decide to cancel our e-newsletter service, whichever comes earlier. sending an email to data-controller@skyclub.com, asking that we stop sending you marketing communications or by including the words “OPT OUT”. It is possible that we could receive information pertaining to persons under the age of 18 by the fraud or deception of a third party. If we are notified of this, as soon as we verify the information, we will, where required by law to do so, immediately obtain the appropriate parental consent to use that information or, if we are unable to obtain such parental consent, we will delete the information from our servers. If you would like to notify us of our receipt of information about persons under the age of 18, please do so by sending an email to data-controller@skyclub.com.